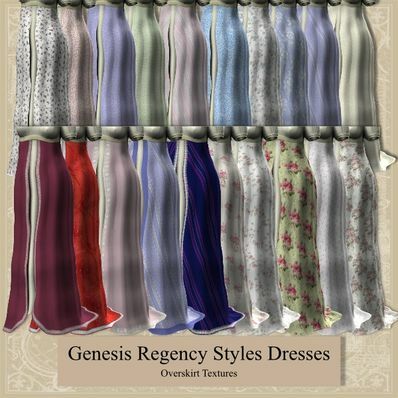 Regency Style Dresses for Genesis for use in Daz Studio 4. Set the Overskirt to collide with either the Summer or Winter Dress. Transmaps included to turn the sleeves into short sleeves, sheer lower sleeves, and to turn the overskirt sheer as well. Apply the texture to the item first, and then apply the transmap. Several textures included. Several Mat zones, so you can change the textures as you wish. Will work with most poses and shapes. Extract the files to your "/Documents/DAZ 3D/Studio/My Library" folder. Like the new site! And I don't blame you a bit for putting more restrictions on stuff because the site rules at a lot of the social sites are way out of line! So when you gonna start doing texture challenges on your stuff? ?